The motivation of most scientists is the drive to unravel the mysteries surrounding us. Speaking from the perspective of a biomedicine student, one of the biggest mysteries in modern biology remains the smallest unit of life – a cell. Although almost three hundred years have passed since the discovery of the cell (Robert Hooke, 1665), it remains a major challenge to investigate individual cells. Due to recent developments, we are now able to characterize single cells by analyzing their transcriptome using single cell RNA-sequencing techniques. Therefore, the RNA of individual cells is ‘tagged’ with a barcode that consists of a defined base pair sequence, which can later be read by sequencing the RNA. However, the possibility to read the transcriptomes of hundreds to thousands of cells in parallel – thanks to individual cell barcodes – generates ‘Big Data’ and its analysis is challenging. At this point ‘bioinformagic’ comes into play, which is better known as bioinformatics. 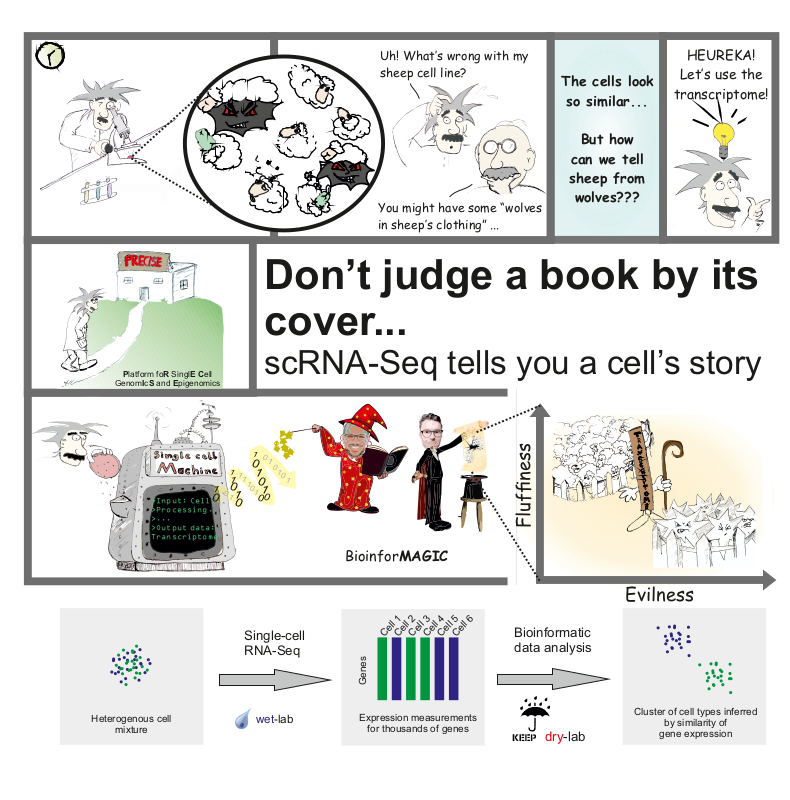 In fact, bioinformatics has nothing in common with magic and that’s why the high-dimensional data – namely gene expression measurements for thousands of genes for every single cell – has to be summarized in a way that makes visualization and interpretation as easy as possible. Therefore, using state of the art algorithms, bioinformaticians can represent cells in a low-dimensional map (e.g. t-SNE) according to their summarized gene expression profiles. In these maps, cells with similar transcriptional profiles lie close together and thus form clusters. Again as a metaphor: A bioinformatician separates cells according to their transcriptome into different clusters just like a shepherd puts sheep into different enclosures based on their inner values.